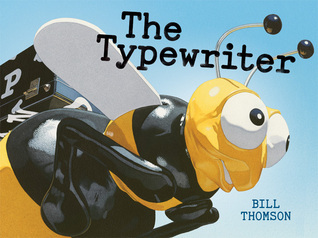 I am excited to interview Bill Thomson on the blog today for his new picture book, The Typewriter. In this nearly wordless picture book, a group of kids happen upon a typewriter on a carousel and suddenly the words they type become their fantastical reality. For readers who enjoyed Chalk and Fossil, The Typewriter is classic Bill Thomson. In your new book, a group of kids discover a typewriter that drastically and magically transforms their surroundings whenever they type on it. If you discovered a magical typewriter, what is the first word you would type on it? This might sound like the standard answer of a beauty queen contestant, but the first word I would type is LOVE. With all the sadness and self-absorption in the world, we could all use more love and compassion for each other. The kids in the story find the typewriter on a carousel. What is significant about the bumblebee on the carousel? The Typewriter, celebrates the power of words. The book intends to foster creativity and encourages young readers to view writing as a fun and powerful tool. To attract the interest of children, I placed the typewriter in a shiny black case adorned with letters on the back of a bumblebee on a carousel. The bee stands out as a different choice from the carousel horses, representing the choice to write as one of the many possible activities that children can devote their time to. When they open the case, the children discover a vintage typewriter with a ribbon that matches the bumblebee. As the children type, their words are brought to life. I hope the ensuing adventure encourages young readers to use their imaginations and appreciate the power of words and the wonderful potential they offer. What can a typewriter do that a computer can't? A typewriter works when the power goes out. A typewriter plays beautiful music in click-clack sort of way. A typewriter also allows us to hold our words, and even offers the chance to crumple them into a ball if we don’t like what we wrote (a delete button doesn’t offer the same release of frustration). And finally, a typewriter connects us to our past and was the tool used to create many great works of literature. Since my blog is about food, books, and travel, what is your favorite food, favorite book, and favorite place you’ve ever traveled? Of all the places I have traveled, my favorite place is Sunset Beach, North Carolina. My family has been going there for forty years, and it is the most relaxing place I know. The beach in The Typewriter was based on photos I took of Sunset Beach (as was the crab that I caught there with my sons). Excluding the Bible, my favorite book is Rodeo Drawings of Murray Tinkleman by Murray Tinkelman. Murray was my undergraduate illustration teacher and he changed the course of my entire life. His fantastic book contains the most beautifully rendered pen and ink drawings that I have ever seen, and although I have had it for over thirty years, it still continues to amaze me to this day. My favorite food is a chilidog from Frankie’s Restaurant in Waterbury, Connecticut. Visiting Frankie’s has been a family tradition for nearly five decades, and while some restaurants may offer fancier food or more luxurious surroundings, there is no place I would rather eat. 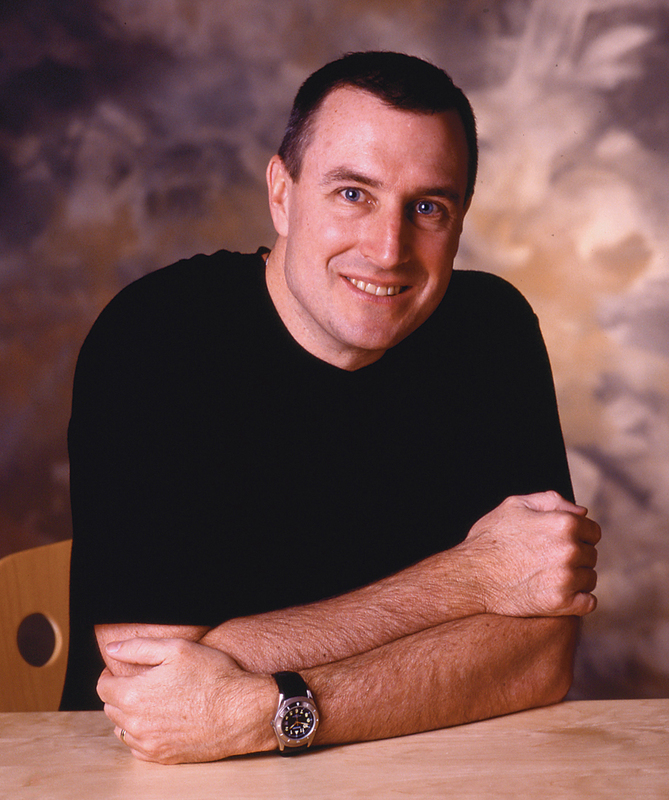 Bill Thomson is the creator of Chalk and Fossil and the illustrator of Baseball Hour, Karate Hour, Soccer Hour, and Building with Dad, all written by Carol Nevius. Thomson’s books have received many accolades: the National Parenting Publications Gold Award, designation as a Notable Children’s Book by the American Library Association, a Teacher’s Choice selection from the International Reading Association, a Booklist Editor’s Choice, the Connecticut Book Award for Children’s Illustrator, Kentucky’s Bluegrass Award, Ohio’s Buckeye Children’s Book Award, and the Prix Livrentête in Paris, France. Thomson’s artwork has also received more than 75 awards in the country’s most prestigious juried illustration competitions. Thomson lives with his family in Southington, Connecticut and is also a professor of illustration at the University of Hartford. To see more of his artwork, visit: www.billthomson.com. Follow all of the stops on his tour! Thanks for the interview and your great questions, Beth! I love the premise of a magical typewriter. I think the first word I'd type is "travel" because I'd love to go somewhere fabulous in the blink of an eye. I love the idea of a magical typewriter. The first word I'd type is "travel" because I'd love to go to fabulous places in the blink of an eye.